Random post. You know those note stuff at Facebook? I got tagged in one of those, but I don’t want to do them on Facebook anymore, until I change my mind (which is unlikely to happen). In other words, I’m just dumping mine here, in case somebody else want to do this. You know, for fun. Certainly, the answers by the one who tagged me (my role-playing okaa-san and friend IRL) were kind of appropriate. Let’s see how mine rolls out after the jump. Last Sunday, I watched the first half of Channel 9’s Rockumentary episode, which featured Filipino rock bands which emerged as champions in the previous Muziklaban competitions, which were held annually (I don’t know why they haven’t done it for two years now). The three bands interviewed for that portion were Manila Under Fire, A Music Theory, and Mayonnaise. Out of the three, however, I am only familiar with Mayo’s music. I really liked the episode. Since I myself ‘tried’ to enter the music scene, I could relate to some of the hardships bands commonly face–financial crises, insufficient skills, poor overall band music dynamics, etc. It’s not easy to form a band. But after forming one, that’s when things are definitely gonna get more difficult. There’s also this band chemistry, which I think is true, as Armi Millare of Up Dharma Down (my top favorite OPM band at the moment) states in her tweet. something about the chemistry of a band. sometimes its so tight that all the members make mistakes at exactly the same time. This little story happened last October 28th at the waiting area just outside Kalimudan Student Center (the sort of canteen in our university). It was just past 5:00PM when I walked on the path beside the said area. Suddenly, a beautiful melody played through the air. It came from the instrument I’ve long adored. The violin. I turned to my left, and saw a female student, about the same age as me, sitting by the table alone. She was there, tapping her left foot to set the pace of the melody she played with her hands. Her graceful movements and poise was almost a rare sight in our institution. The sounds that reverberated tugged my heart and told me to stop. The title of this post is self-explanatory, though it might be a misleading title in the latter part of this post. I assure you that this is neither a hate or love post. This is a reaction and reflection post. 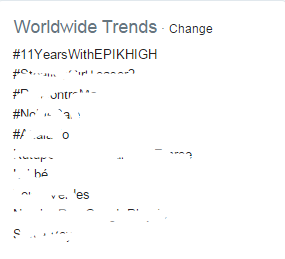 Last May 27, 2014 the twitter world was shaken by the top worldwide trend. “No to KPOP,” it said. 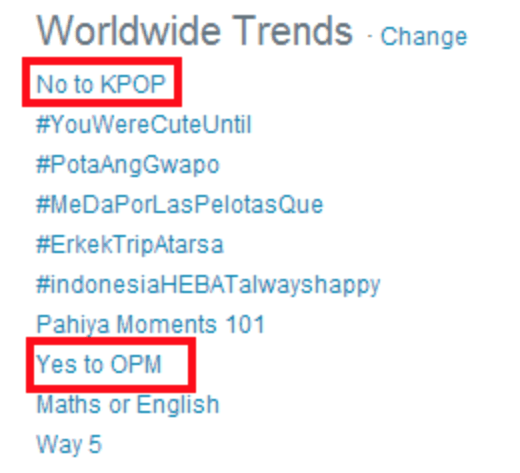 What made this incident more interesting was the fact that “Yes to OPM (Original Pinoy Music)” also trended. Screenshot of the moment when both topics trended worldwide in twitter.